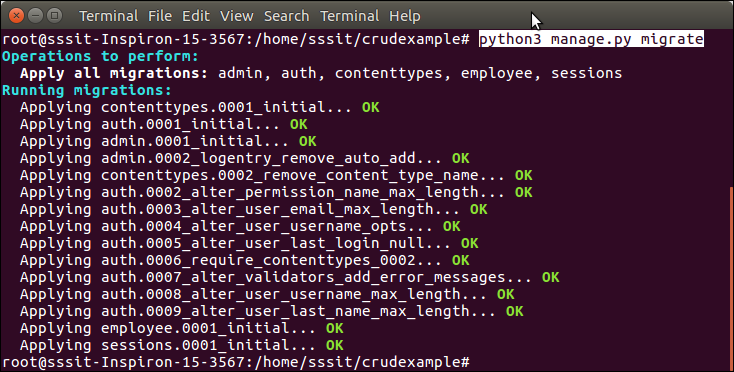 To create a Django application that performs CRUD operations, follow the following steps. 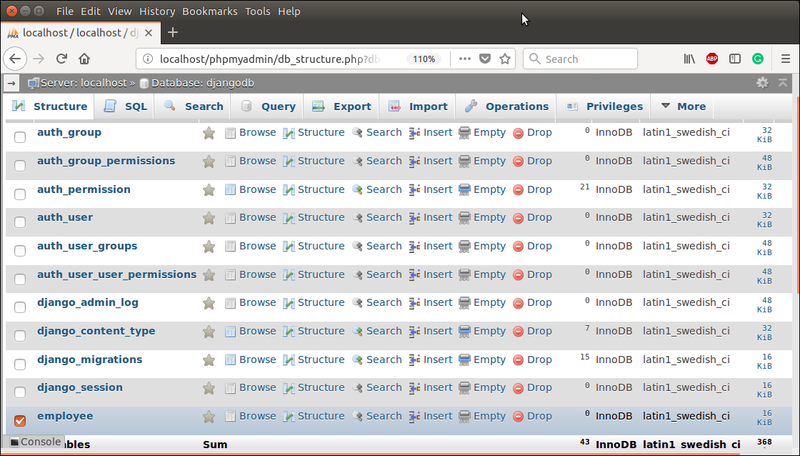 Create a database djangodb in mysql, and configure into the settings.py file of django project. See the example. Put the following code into models.py file. from django.db import models class Employee(models.Model): eid = models.CharField(max_length=20) ename = models.CharField(max_length=100) eemail = models.EmailField() econtact = models.CharField(max_length=15) class Meta: db_table = "employee"
from django import forms from employee.models import Employee class EmployeeForm(forms.ModelForm): class Meta: model = Employee fields = "__all__"
Provide URL patterns to map with views function. 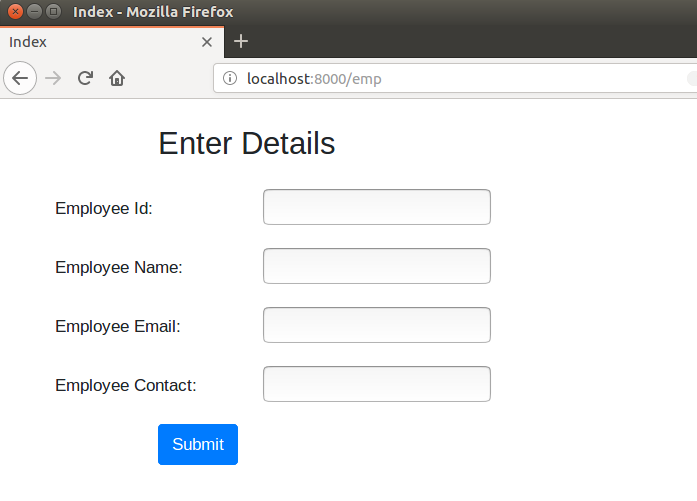 Create a templates folder inside the employee app and create three (index, edit, show) html files inside the directory. The code for each is given below. Create a folder static/css inside the employee app and put a css inside it. Download the css file here Click Here. Create migrations for the created model employee, use the following command. After migrations, execute one more command to reflect the migration into the database. But before it, mention name of app (employee) in INSTALLED_APPS of settings.py file. Run the command to migrate the migrations. 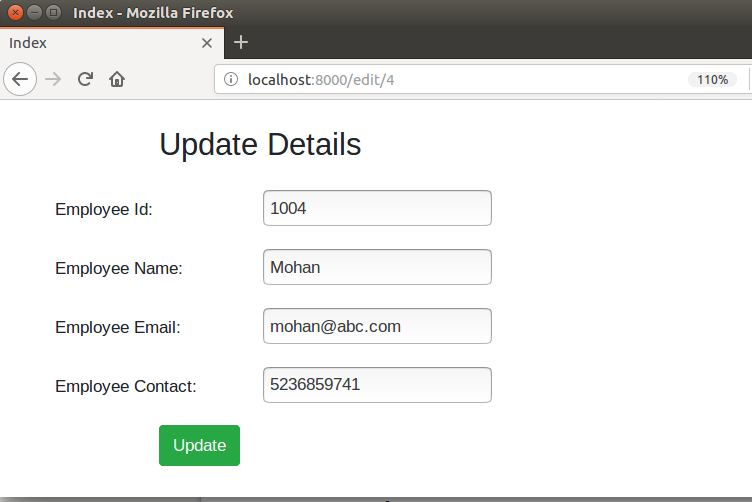 Now, our application has successfully connected and created tables in database. It creates 10 default tables for handling project (session, authentication etc) and one table of our model that we created. See list of tables created after migrate command. To run server use the following command. 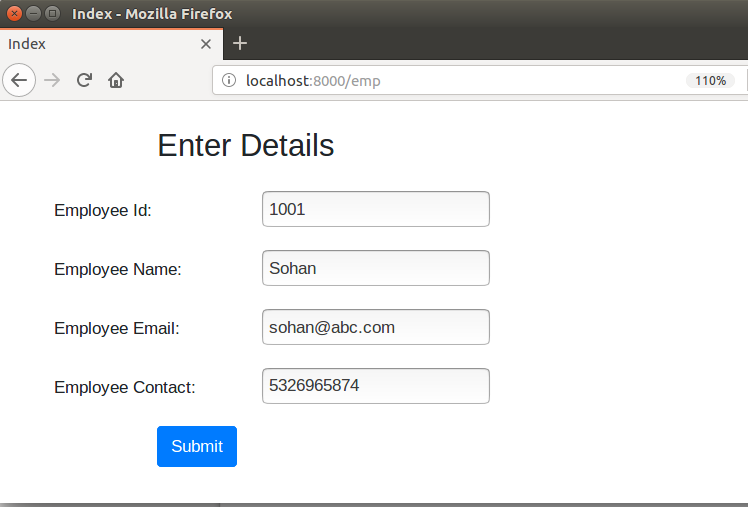 Access the application by entering localhost:8000/show, it will show all the available employee records. Initially, there is no record. So, it shows no record message. Click on the Add New Record button and fill the details. See the example. Submit the record and see, after submitting it shows the saved record. This section also allows, update and delete records from the actions column. After saving couple of records, now we have following records. Lets update the record of Mohan by clicking on edit button. It will display record of Mohan in edit mode. Lets, suppose I update mohan to mohan kumar then click on the update button. It updates the record immediately. See the example. Click on update button and it redirects to the following page. See name is updated. Same like, we can delete records too, by clicking the delete link. Suppose, I want to delete Sohan, it can be done easily by clicking the delete button. See the example. After deleting, we left with the following records. 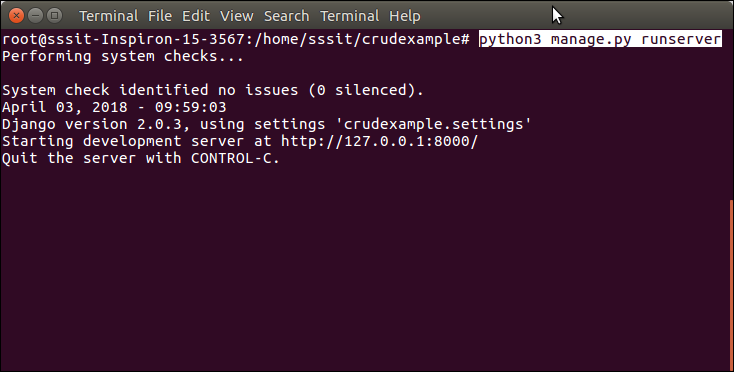 Well, we have successfully created a CRUD application using Django. This complete project can be downloaded here.